Ten years in the making. A reported budget of $30 million. A crew of dozens. That’s what I knew about “The Vietnam War,” the ten-part, eighteen-hour documentary directed by Ken Burns and Lynn Novick that begins airing tomorrow night, September 17, on PBS stations across the country. I also knew that Burns and his film company did not contact Vietnam Veterans of America during the making of what promised to be a monumental documentary on our war. I knew that VVA—the nation’s only congressionally chartered veterans service organization that since its founding has worked on behalf of Vietnam War veterans and their families—could have helped Burns in innumerable ways with the film. Burns and company evidently did not think so. Without VVA’s input, many of us had concerns that the documentary would paint an unfairly negative picture of the men and women who took part in the war. There also were concerns that the film would denigrate our service by showing only the worst actions of a few troops. And that it would not tell the true story of the war. Those concerns, I am pleased (and relieved) to report, disappeared after I watched all eighteen hours of the documentary. The good news is that “The Vietnam War” does not do anything whatsoever to demean, demonize, or denigrate the service of the American men and women who served in the war. Many stories are told and all show us doing our jobs in often impossible situations. What’s more, the American Vietnam War veterans who appear in the film are uniformly articulate, introspective, and well-informed. Their demeanor and what they have to say reflect very well on the 2.8 million of us who took part in the war—at least with respect to the men in combat jobs. (More on that below). Those veterans deserve our thanks for representing us—the men and women who served in the nation’s most controversial overseas war. So thank you, especially to the accomplished and well-spoken veterans whose voices are heard throughout the series: Everett Alvarez, Philip Caputo, Bill Ehrhart, Joan Furey, James Gillam, Roger Harris, Mike Heaney, Matt Harrison, Stuart Herrington, Hal Kushner, Karl Marlantes, Merrill McPeak, John Musgrave, Tim O’Brien, Peter Okamoto, Rufus Phillips, Tom Vallely, and the late Robert Rheault and Sam Wilson. 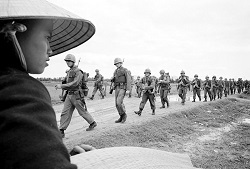 To its credit, the doc also contains the first-person testimony of a flock of NVA, VC, and ARVN veterans, as well as former newspaper correspondents (most notably and effectively Joe Galloway and Neil Sheehan), along with the reflections and remembrances of former members of the U.S. antiwar movement and informed South Vietnamese civilians. Among the most enlightening in that group is Duong Van Mai Elliott, a smart, well-spoken woman who worked as a translator for the Americans in Saigon, married an American, and now lives in this country. All of that first-person commentary nicely augments hours and hours of archival war footage and photographs and TV reporting of the war. As far as the history Burns and company spin out, it is accurate, going back to the French colonization in 1858 and covering World War II, the French War, and the American War. I found only a few very minor errors and omissions. The narrator, Peter Coyote (whose grave voice, tone, and inflection work very well, by the way), mentions the “Congressional Medal of Honor,” for instance, and refers to the Wall in Washington as the “Vietnam Memorial.” Memo to Ken Burns (and the documentary’s writer, Geoffrey C. Ward), it’s just the Medal of Honor and it’s the Vietnam Veterans Memorial. Also, the documentary focuses almost entirely on those who served in the combat arms. Which is understandable and not inappropriate. However, Burns and company give but a very, very brief nod to the more than two million men and women who served in support roles in the war. There should have been a bit more on the soldiers, sailors, airmen, and Marines who were not in the jungles, rice paddies, and Delta rivers. 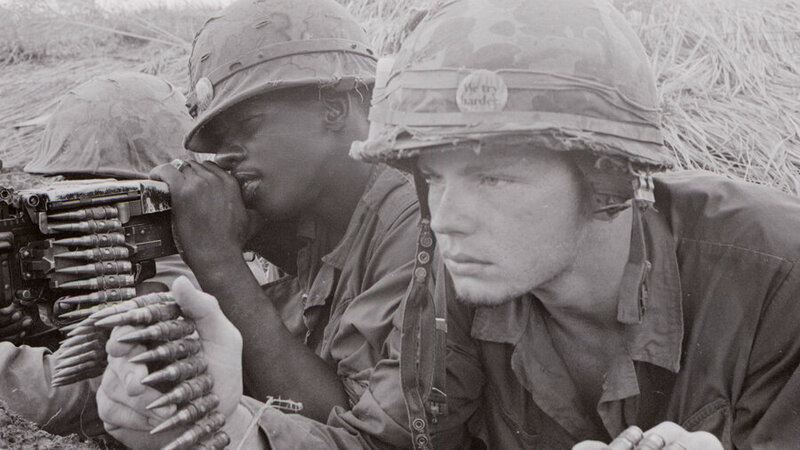 The support troops were not out there facing the enemy every day, but—because of the nature of the Vietnam War—they found themselves in harm’s way in Vietnam during the war in service to their country. Still, these are nitpicks. What we get about virtually everything else in the film is on the mark. That includes issues as complex and controversial as why the Americans helped France regain its Indochinese colonies after World War II; the 1963 Diem assassination; the 1968 Tet Offensive; the 1968 My Lai Massacre and its explosive aftermath in 1969; the 1970 Cambodian Incursion; the “secret” bombing of Laos and Cambodia; the 1968 presidential election campaign; and much (much) more. The film’s history of the war greatly benefits from on-target analyses by military historians, former military and civilian leaders, former war correspondents, and one-time policymakers. This film shows clearly that the top leaders on all sides are to blame for the horrors of that war. That includes primarily Le Duan, the uncompromising hawkish general secretary of the North Vietnamese Communist Party; the corrupt South Vietnamese leaders Ngo Dinh Diem, Nguyen Cao Ky, and Nguyen Van Thieu; and Presidents Kennedy, Johnson, and Nixon—all of whom deceived the American people about many of their real reasons for prosecuting the war. Also justly condemned: nearly all of those presidents’ top policy advisers, headed by Secretary of Defense Robert McNamara and National Security Adviser and Secretary of State Henry Kissinger, along with MACV Commanding Gen. William Westmoreland. The documentary goes into deep detail on their individual perfidies. A word of warning about the documentary’s extremely graphic nature. Rarely have there been more images of dead and mangled bodies (American, ARVN, NVA, VC, civilians) and close ups of firefights, ambushes, battles, bombings (from B-52s to napalm) in a documentary on any war. Vietnam Veterans of America is well aware that these scenes and others may bring back powerful emotional memories among Vietnam War veterans. We urge veterans not to watch it alone. If veterans do find themselves bothered by strong emotional memories, VVA is encouraging them to call The Veterans Crisis Line at 800-273-8255 (Press 1) or The Vet Center Combat Call Center at 877-WAR-VETS. Extra operators will be on stand-by during the evenings the documentary’s episodes are aired. Editor’s note: The views represented in this review are solely those of the reviewer, VVA Veteran Arts Editor and columnist Marc Leepson. They do not represent the views of Vietnam Veterans of America.